Tomorrow is the official start of the Annual Regional Conference of the New England Chapter of the Association for Conflict Resolution, a three-day, action-packed event featuring Interviews with the Masters; a Master Class taught by Doug Stone, co-author of conflict resolution classic Difficult Conversations; one full day devoted to workshops and schmoozing; and an Advanced Training led by guerrilla negotiator and ADR bad-boy Robert Benjamin. Fellow blogonauts Robert Ambrogi and Dina Beach Lynch will be joining me at the Annual Conference to present “Blogging for Fun and Profit”, a workshop aimed at evangelizing ADR professionals to join the exciting world of blogging. 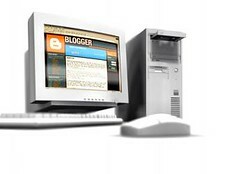 It costs nothing to set up and launch a blog--what's not to like about free? If you think blogging is something you’d like to explore, buy yourself a couple of books to introduce yourself to basic concepts, tools, and blog publishing platforms. Start with the obnoxiously titled Blogging: Genius Strategies for Instant Web Content by Biz Stone. Don't let the title turn you off--despite the fact it’s starting to show its age, the book provides a solid introduction to blog beginners. Then follow up with Susannah Gardner’s Buzz Marketing with Blogs for Dummies, designed with the entrepreneur and business professional in mind. Imitation, as they say, is the sincerest form of flattery. I would encourage you to explore other blogs as well to gain ideas and inspiration for creating your own blog. Take a look at my blogroll over there on the right in my sidebar (under the heading "The Blogs I'm Reading"). There are some top-shelf blogs listed there. That’s it for now on blogging. Coming up soon: Faux pas and pitfalls: What ADR bloggers should watch out for. By the way, if you haven’t registered yet for the Conference, there’s still time and space left (although registration is now closed for the Advanced Training with Robert Benjamin). Click here for details and scheduling.